I came across this picture earlier today from someone trying out Periscope (mobile live streaming). Notice the stats. 100% retention. I'm sorry... that's not retention. That's crappy analytics. 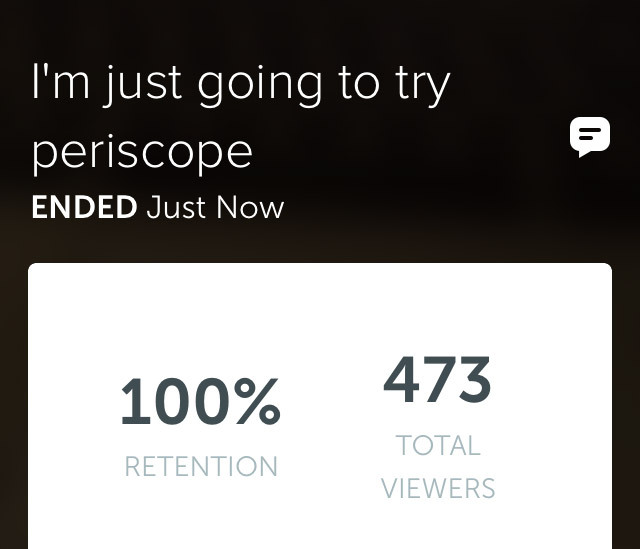 100% retention on my first Periscope! See the problem? You can't measure retention based on just one session. Retention is how many people who remember you, over time. So, you need at least two sessions to calculate retention, but even at that, this wouldn't be a real number. Because, did people come back because they remembered you... or because you told them to? One is frequency linked to you advertising your presence. The other is frequency linked to retention. Those are not the same thing. Again, you see the problem? 12 people watched a total of 15 minutes, which means that, on average, each person watched on 1min 15sec. Is that viewer? No, not really. This gives you an average viewer time of 12 seconds. That is not a viewer. They are not actually viewing the live stream for long enough to get any value from it. It's the same time as it took you to read this paragraph. The best way to describe this is to call it 'channel surfing'. You know, the kind thing you used to do on the TV in the old days when you weren't really paying attention. So, this is all crap. Let's get some real analytics. Real analytics would segment the viewers into those who surfed by but didn't pay attention, and those who decided to stay. Those are very different audiences. And real analytics would measure how people arrived (real retention). We don't need more crappy analytics that only serve to mislead people. We already have that, and it's kind of annoying.